Lake Neuchâtel combines one of Europe’s most beautiful nature reserves with the pleasure of a glorious, versatile water sports paradise. 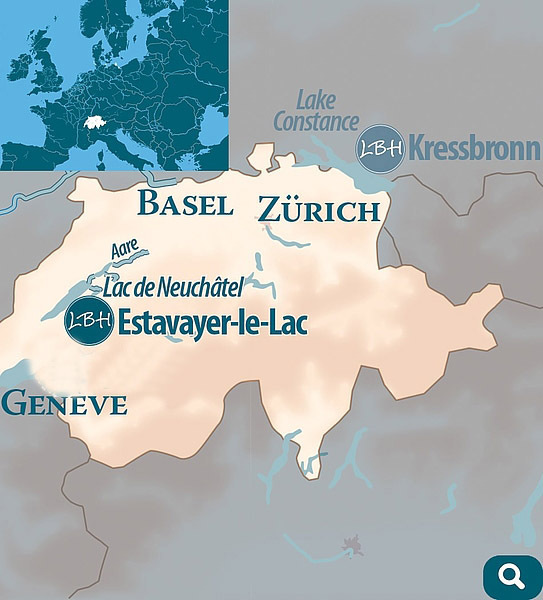 It’s the land of three lakes: Neuchâtel, Bienne and Morat: The largest continuous area of lakes and rivers in Switzerland invites you to explore this unspoilt, wonderful landscape on board your Linssen charter yacht. It‘s not only Lake Neuchâtel that is worth a visit, you should also take in Lake Bienne and Lake Morat as well. On your Linssen, you will reach these lakes easily via wonderful canals, either the „Canal de la Thielle“ or the „Canal de la Broye“. Pure relaxation combined with professional support and top-class Swiss cuisine and hospitality. At the foot of the Jura Mountains, in the linguistic border area of Switzerland, you will find the perfectly preserved mediaeval town of Estavayer-le-Lac on the southern shore of Lake Neuchâtel: the starting point of your cruise over the Swiss lakes. Town gates, picturesque houses and romantic, narrow alleys provide the typical image of Estavayer, the „city of roses“. Its outstanding features are Chenaux Castle and the Collegiate Church of St Laurent (the 14th century) with its gothic choir stalls. Estavayer-le-Lac has the best equipped water sport centre in Switzerland. One of the highlights of the year is the Estivale Open Air, the music festival held on the banks of Lake at the end of July and beginning of August. The university town of Neuchâtel is situated on the northern shore of the lake and is about two hours’ sail away. The mediaeval town centre, Neuchâtel Castle and the 12th century collegiate church are only a few minutes’ walk from the marina and are what gives Neuchâtel its special charm. You can have a pleasant stroll along the long beach promenade.